I had spent close to 3 hours writing and editing a post which I published and all seemed funky. After tweeting the link and getting a few initial comments imjustcreative.com went down. The problem was a bad database connection which meant I had no access whatsoever to any part of the website including the WordPress admin area. This was the first time I had experienced a database problem so I assumed the panic position. It slowly occurred to me that I had subscribed to VaultPress so I set about finding out how to allow VaultPress it’s time to shine. After confirming the severity of the diagnosis via PHPMyAdmin, in my case a number of the databases were corrupt beyond being optimised or repaired, the real option was to replace them with previous versions; in this case just a few minutes old as VaultPress had just completed it’s last back-up. The procedure was pretty painless: access my VaultPress account, download the database archive, unzip then upload back to my WordPress installation using PHPMyAdmin. The last step was the one I felt a little uncomfortable with as you need to delete the corrupt databases then upload the new ones. I found a nice article online that showed me enough about the the process, and it was in fact a doodle to do. It just looks more complicated than it is. I believe VaultPress are looking into the automation of this part of the process which would be good for complete ungeeks. Being able to sort this mess within 20 minutes, and without having to call on my host York Networks, saved my site from being inaccessible for a significant period. The following isn’t a review of VaultPress it’s more of a brief summary that may encourage you to check it out for yourself. Would You Benefit From VaultPress? How important is your WordPress website to you? How long have you been posting and writing articles to it? Do you rely on your website to attract new clients? Do you write lots of cool articles on your blog which have attracted loads of back-links and valuable Google juice? How much time in total do you think you have spent on your website and it’s content? Does the idea of your site going down in any way scare the crap out of you? Do you know if your website host has an adequate onsite/offsite back-up strategy? What would happen if your website went down and your host did not have an adequate onsite/offsite back-up strategy as recently demonstrated in Australia? In the case of: website corruption, database corruption or if you inadvertently delete some files whilst coding or fiddling, the best you can usually hope for is your host having a daily back-up of your website and it’s data. The most data you would likely loose should be no more than 24 hours but it’s the down-time that can still create a number of frustrating problems. Then there is the possibility that you have spent the day updating your website or writing a lengthy post prior to the website going off-line in which case you can pretty much say goodbye to all that work. The reality is that 24 hours can equate to a huge chunk of work and inspiration that can be hard to redo not to mention frustrated visitors trying to view your site. One solution is to get into the habit of manual website and database back-ups but for most people this is tedious, time-consuming, and needs a certain level of FTP type geekery. For the rest of us there hasn’t really been a back-up and peace-of-mind solution that fills in this precious 24 hour period; until recently that is. 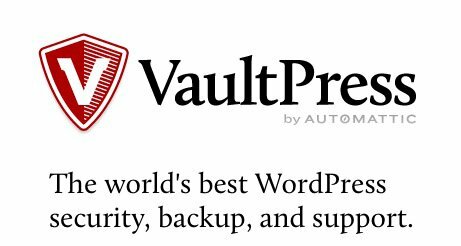 VaultPress runs within your WordPress installation and routinely keeps all your precious WordPress data backed-up and archived which includes: databases, plugins, themes and uploads. For example: in the event of a corrupt WordPress database, VaultPress will allow you to download a recent back-up that will enable you to fix your problem in no time. This means you will not have to rely on your host to retrieve the appropriate files from their own archives which would likely take time to arrange and execute. 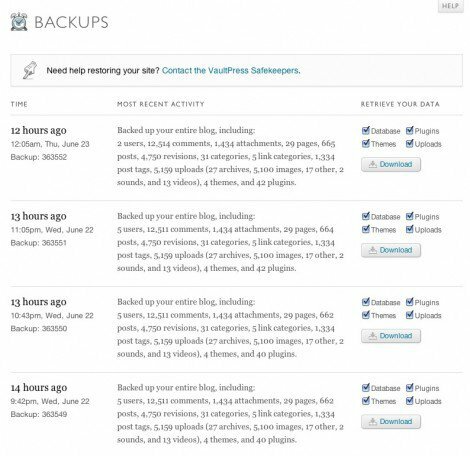 There is more to VaultPress then data backup: you have access to various stats as well as detailed and easy to view logging of all activity that happens within WordPress. If any kind of downtime scares you then VaultPress will have you covered. Having experienced the peace of mind that VaultPress gave me is what inspired me to write this article. For $15 a month I now have the utmost confidence that if my website goes down for any reason or if my host should suffer a catastrophic melt-down then VaultPress ensures that my all my hard work is safe and sound. If your website is important to you then I would seriously consider looking at VaultPress.